This is one of a group of five unfinished sketches from Samuel Cooper's studio which survive in the Royal Collection. The remaining miniatures in the group show Catherine of Braganza (420644), Barbara Villiers, Duchess of Cleveland (420109), James Scott, Duke of Monmouth and Buccleuch (420645) and George Monck, Duke of Albemarle (420086). The artist would have worked up these sketches directly from the sitter, possibly with a view to completing them if further commissions were forthcoming. The evidence for this group of sketches having been in Cooper's studio is provided by Grand Duke Cosimo III de' Medici, who recorded having seen two such sketches when he sat for his own portrait in London in 1669. 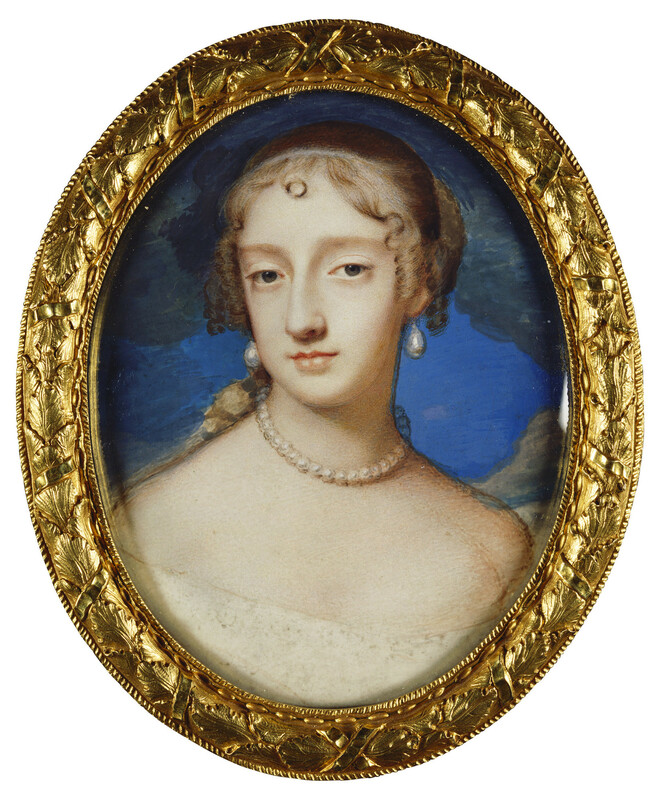 One of these, described as 'an unfinished miniature of Madame the Duchess of Richmond when she was a young girl' can probably be equated with the present sketch; the Grand Duke commented that it was 'executed with much spirit and charm'. So impressed was the Grand Duke by Cooper's work that he made enquiries about purchasing remaining works from the artist's studio after Cooper's death in 1672. The information furnished to the Grand Duke by his agent, Francesco Terriesi, suggests that all five sketches were still being offered for sale by the artist's widow in 1677 and at least one was still available in 1683. By that stage, the Grand Duke had lost interest in purchasing the set, largely on account of the high price, which he felt was unreasonable on account of their unfinished state. This sketch is itemised in the list sent to Cosimo de' Medici in 1677 as: 'The Duchess of Richmond at 16 or 17 years of age'. It must therefore have been painted c. 1663-4 shortly after Frances Stuart's successful debut at court, and certainly before she caught the smallpox which so disfigured her in 1667. 'It would make a man weep to see what she was like then and what she is like to be, by people's discourse, now' Samuel Pepys wrote on seeing Frances Stuart's picture (probably the present sketch) at Cooper's house in 1668. No completed miniature based on the sketch is known to survive, althought Cooper did paint her on a number of other occasions in different poses (see 420102). Frances Stuart was Maid-of-Honour to Catherine of Braganza when Charles II became enamoured by her in 1663. She eloped with Charles Stuart, Duke of Richmond and Lennox and was forced to leave court temporarily, but returned to live out her widowhood at court until her death in 1702.